Katherine Hull’s victory yesterday will probably not go onto my all-time Fluke Victories list, although it is a contender for Fluke Victory of 2008. In 109 career starts, the Aussie now has nine Top 10 finishes (1 second, 0 thirds) with 50 missed cuts. Her Top 10 percentage of .083 is better than any of the Top 20 Flukes but that MC rate of .458 is right in the middle of them. Even with the victory and money list boost it provides, Hull still falls short of my Top 30 rankings (about #35). Time will tell if Katherine’s game has just taken a leap forward but judging by the recent examples of Cavalleri, Friberg and Lindley, the answer to that question is probably “no”. What makes this win even more unlikely – the strength of the field in Ottawa was very good. The Field Score was only the 12th strongest of the year (out of 23 events) but was much tougher than the fields that Friberg and Lindley conquered. 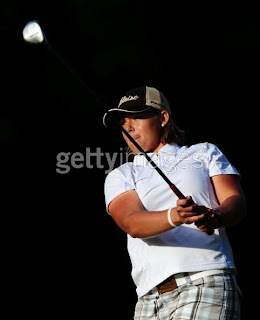 Hull had made six straight cuts coming in and finished sixth at State Farm (she was #32 on my Hot List, ahead of Sorenstam, Pettersen and several other Top 30 players) so her game was on the upswing but her odds of winning still had to be in the astronomical range. As I mentioned last night, Hull gets the well-deserved Big Surprise Award. Does anybody else think she looks like Wendy Ward? The Big Disappointment was Karen Stupples, who missed her second cut of the year. It had to be a crushing loss for Yani Tseng. She is noticeably absent from the post-round interviews at lpga.com and declined to comment for the AP. This was the second straight lead she had carried into Sunday where she failed to bring home the win. Not just any lead either – she led State Farm by two and led here by four. Tseng also held the lead during the final round of the Ginn Open before succumbing to Lorena Ochoa and was tied for the lead at the MasterCard until a late bogey cost her that title. Yani is already the odds-on Rookie of the Year favorite and one of the five best players in the world – to get into Player of the Year territory, she has to overcome this mental barrier like Ochoa did. The Ottawa Hunt & Golf Club layout was no pushover. 74.03 was the average score, more than a shot above the 2008 average. Only 20 players finished the event under par. I can’t possibly count Ochoa out – although she’s six behind, she only has two players to catch. Of course, Katherine was in exactly the same position. Although her Christian demeanor probably wouldn’t allow it, Hull has every right to say “Stick that up your prognosticator, Hound Dog!” She sure sawed off that limb I climbed out on after Round Three. And that’s what makes this game so great. You can look at a leaderboard and say “Tseng’s going to win” and “if she falters, Pak or Ochoa will take it” and put any number of extra qualifiers on your statement and you can still be dead wrong at the end of the day. When I get a prediction right I’m often surprised because so many factors (not the least of which is the depth of talent on Tour) can influence the outcome. Without Katherine Hull, Leta Lindley, Louise Friberg and Silvia Cavalleri, the LPGA would be a lot less fun to watch. Thanks for posting it over here.